Topics: Permitting Info, Hi-tide Boat Lifts, Lift & Dock Accessories, Smooth Faced Walls, Navy Walls, and Services. 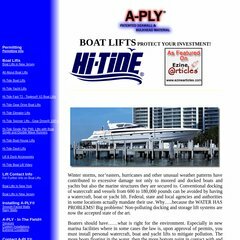 a-ply.com Boat Lifts by ACE - Protect Your Investment! There are 4 DNS records, such as dns249.d.register.com, dns110.a.register.com, and dns219.b.register.com. American Registry For Internet Numbers (Virginia, Chantilly) is the location of the Apache server. Its IP Number is 69.49.96.24.